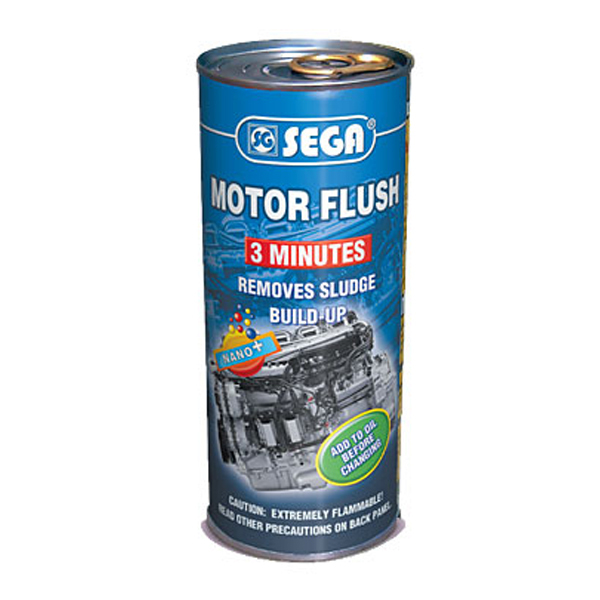 SEGA Engine Flush is a highly detergent concentrate. designed to clean all oil lubricating systems prior to oil change. - Cleans engines, hydraulic systems, gearboxes and differentials internally. - Quickly and efficiently dissolves varnish, sludge and other contaminants from vital engine parts. - Prevents contamination of fresh oil by residues left behind. - Frees sticking internal engine components by dissolving deposits. - Provides extra protection during the treatment. - Ouietens noisy hydraulic valve lifters by removing deposits. - Is compatible with all mineral, synthetic. single and multi grade oils and suitable for regular and low SAPS applications. Engines: Add contents of a can SEGA MOTOR FLUSH to the used engine oil before the oil change, while the engine is warm. Let idle without load for 20 minutes. While engine is still warm, drain crankcase. Change ail?lter and oil. Treats 3 to 6 litres of oil. Transmissions (manual) and differentials: Add 5 % to the oil. Drive I to 8 hours without overcharging. Drain oil and refill. All petrol and diesel engines of vehicles and stationary equipment. Earboxes (non-automatic). differentials and reduction cases.